Meet The Most Awesome Person Ever, as well as The Most Stylish Person At NYFW, both such HIGH HONORS TO RECEIVE FROM SOMEONE AS GREAT AS I, OF COURSE, no, but, really, a very cool person, and oh my God let's add us some more commas, because this isn't annoying enough, but anyway, the most stylish person I saw all week -- Caroline Torem Craig. 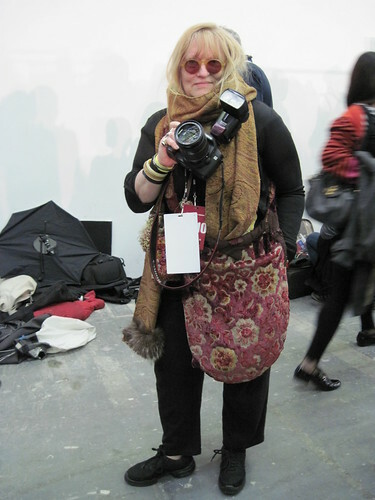 She is a party/backstage photographer I spoke to at Alexander Wang and one of the most good-hearted, unashamedly bonkers people I've been lucky to come across at any Fashion Week. She makes her own clothes and embroidered her name into this scarf (which wrapped around her neck five times) so no one would take it. If you click on this picture and go to "all sizes" on its Flickr page you can kind of see the beaded Jimi Hendrix bag (also her own creation) and close-ups of her massive jewelry. I mean, SO GOOD, right? Total good vibes and let's all just chill out and be happy, fashn ppl and totally REFRESHING. Plus, she had tinted pink glasses before the Marc Jacobs show. "You need to run to Italy!" she told me, off-topic though it was. "You'd love it. I'm German but I was born in Amsterdam. Then I just moved here and married everyone I liked!" Now she is married to a Rasta. "When we walk down the street, people just run the other way!" Yes, but that can be quite helpful. Then you automatically filter out most of the narrow-minded people. "Well yeah, believe me, it's great!" She listened to what I thought about the industry and had interesting replies. She obviously loves clothes and fashion but on a level that is totally different from the stuff about key season pieces and all that. She enjoys dressing in a way that seems so pure; something often lost in the fog of Fashion Week. I hope I can see her again.